This month's Baking with Spirit Challenge over at Cake of the Week is Midori. Well, um...Let me see. Midori. 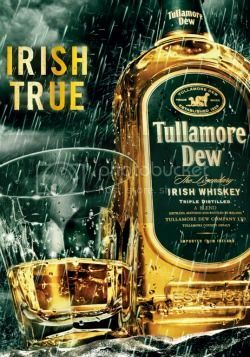 Never tried it and not in the BIWB liquor cabinet. What to do? First, immediately go to BevMo, get a bottle and taste it. Check. Second, search the Midori web site for cocktail and recipe ideas. Check. Fourth, search the internet for baking recipes using the Japanese Slipper as inspiration. Check. 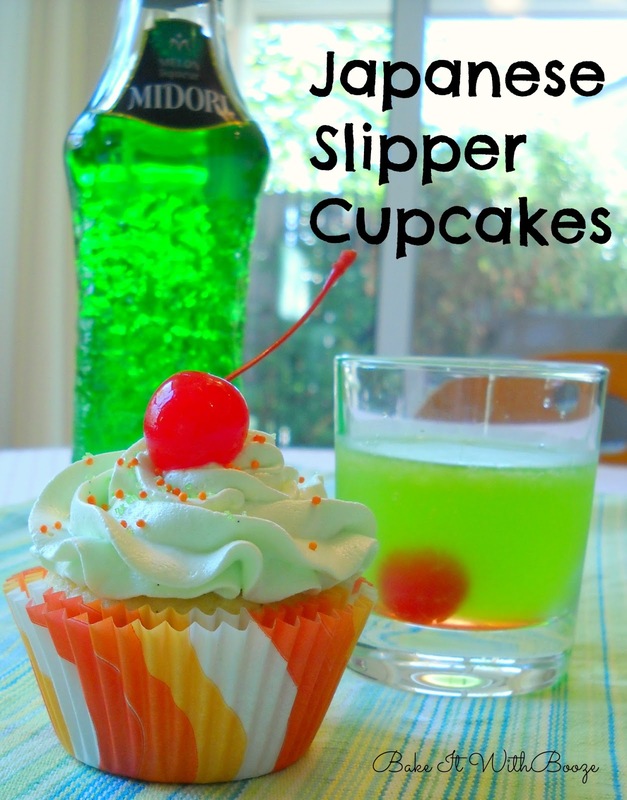 So, believe it or not, there is only ONE recipe on the web that I could find for a Japanese Slipper Cupcake. The Lone Baker. Nice name, killer photo. Once I had the idea and a good graphic, I set to work creating a solid recipe that I thought would bring out the 3 flavors of this cocktail: Midori, orange (Triple Sec) and lemon. I knew that baking with Midori might be tough, so I decided to just use it in the frosting. That left the cupcake to be the showcase for the orange and lemon flavors, with the addition of Triple Sec of course. Found my cupcake recipe "base" on Paula Deen's website. I know...Think what you like. But, you have to admit, she does have some very good recipes. 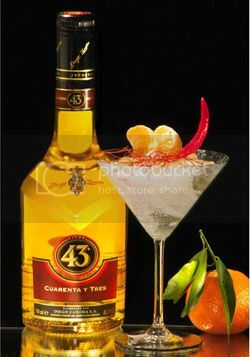 I needed something to bring out the citrus flavors and hold up with the Triple Sec. Check. Scored on her recipe for an orange creamsicle cupcake that infuses the citrus zest into the sugar. Great technique and something I will bring to all my citrus baked goods. And, I will tell you, this Midori Seven Minute Frosting has changed my life. 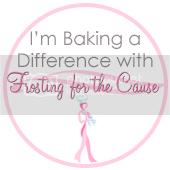 I had no idea this frosting was so easy and so delicious. We never had this when I was a kid because we didn't have a stand mixer and there was no way my mom was going to stand with a hand mixer for 7 minutes. Lower in fat, too, than buttercream frosting. A good thing! Thank god for my Kitchen Aid mixer, Bella! And, now I also have no fear of my future with Swiss Meringue Buttercream. These are a shocking light green color and I love the pop of orange in the liners and sprinkles on top. Super moist and so full of citrus flavors. A very nice cupcake version of the Japanese Slipper Cocktail. Super festive, too!! And, please check out all the other Midori-inspired baked creations this month at Cake of the Week. This pie is really a tribute to my grandmother, whom we called Bambi. Bambi, you say? Story goes that my oldest brother, Chris, couldn't pronounce "grandma," so somehow 'Bambi' stuck. It was always cool to have a grandmother with this very unique name. Bambi was legend just like this pie has proved to be. My uncle used to talk about "Mama's cot pie." He mentioned once that he thought that Bambi cooked the apricots before placing them in the crust. 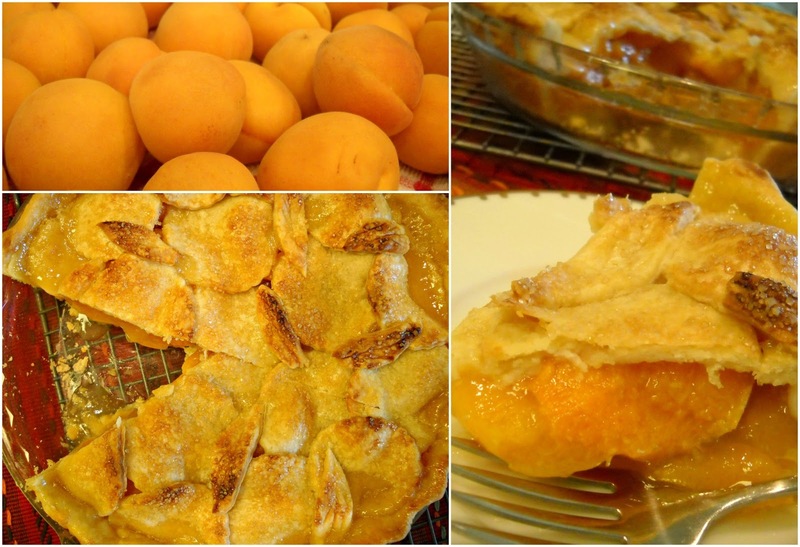 I've seen a few old-fashioned pie recipes that call for cooking the apricots in a cornstarch-thickened sugar mixture. Kinda like the same filling used in lemon meringue pie. 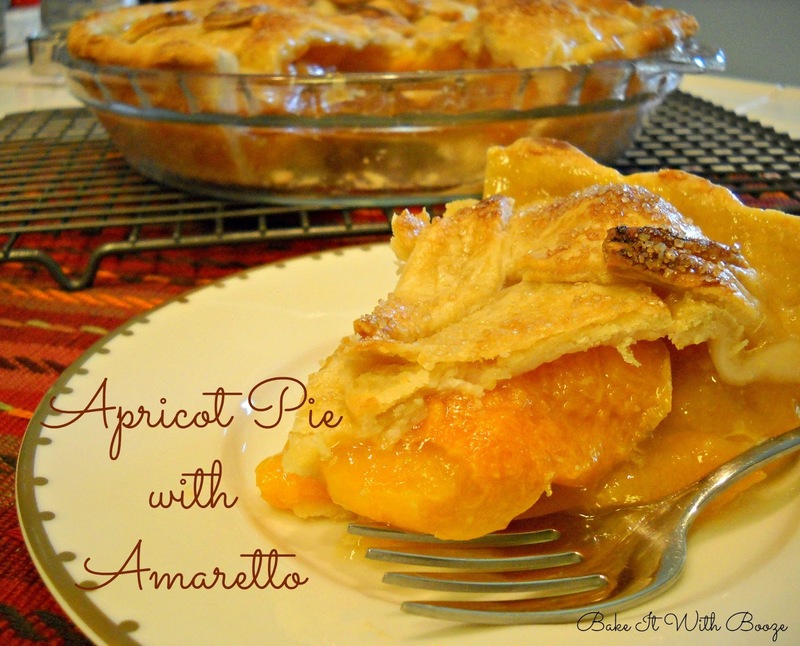 With that bit of baking 'hint' I knew I could use my strawberry rhubarb pie as a basis for this Apricot Pie with Amaretto. So easy. 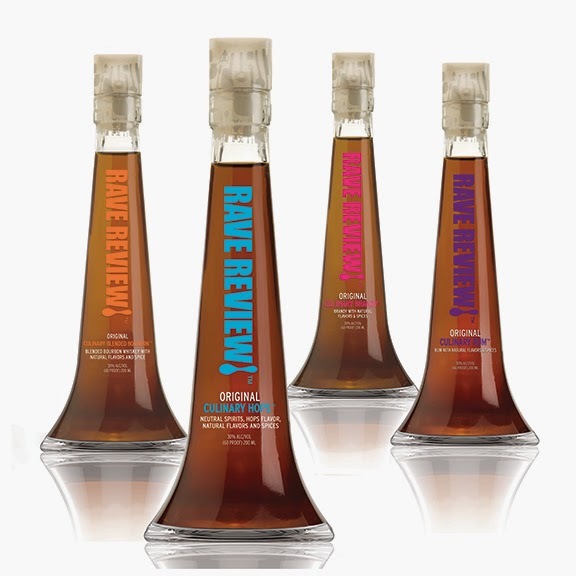 I wasn't sure which type of booze to add to the filling...Initially, I had thought about brandy. But, apricots and almonds just seem to go so well together. And, this time it's a hit! I think it's fitting, too, that these apricots are from an orchard adjacent to Bambi's property in Esparto, California. Manas Ranch is located in Esparto, a very small town where my parents were born and raised. I have many, many fond memories of spending time with Bambi in Esparto. We'd stop by this orchard, right next to Bambi's almond orchard, pick some cots and drive around Capay Valley eating cots and chucking the pits out the car window. Probably the best parts of spending time with Bambi were listening to all the family stories and adventures she had, starting first with her experiences at the speakeasies in Sacramento as well as her teaching me to drive when I was 14. Pretty cool when you can drive at 14, pass the local sheriff and not get pulled over. That's what you do in the country. 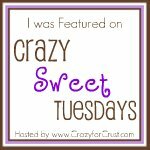 I know you'll love this fresh and easy pie. The amaretto really does add a nice depth to the filling. I also used amaretto in the crust this time with great results. I hope you have a chance to make this pie. For me, enjoying a sweet and silky piece of this memorable pie is truly like coming home.